22 alleged people smuggles were flown by a charted plane from Christmas Island to Darwin last night, arriving just after midnight. Immigration Minister Chris Evans spokesperson Simon Dowding denied the men were being move to the Darwin Immigration Detention Centre to relieve overcrowding at the Christmas Island facility. The men who said the were from Indonesia were escorted by five minders as they walked from the Customs arrivals area at Darwin Airport to a coach parked near a side exit. The men, believed aged in their late teens to mid-30’s were driven from Darwin Airport to the Darwin Immigration Detention Centre at around 1:30am. Australia Federal Police will interview the men to determine if they have committed people smuggling offences under Australian law. 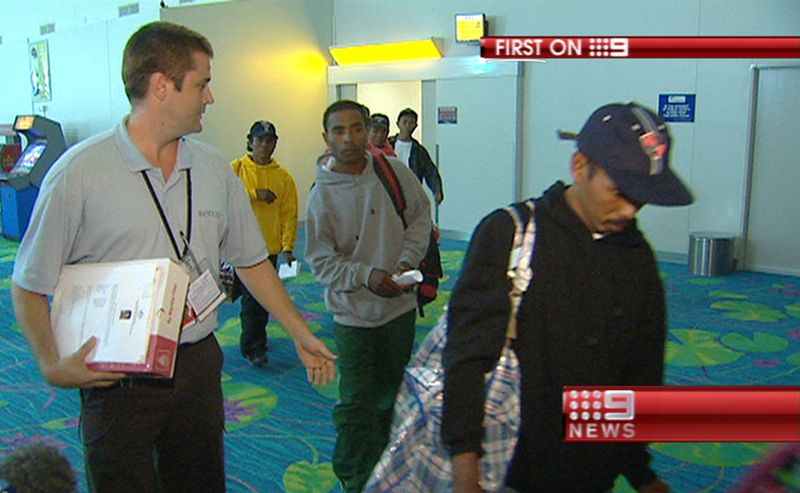 According to the AFP website, 118 people have been charged with people smuggling since September 2008. The offence carried a maximum penalty of 20 years imprisonment and/or a $220,000 fine. This entry was posted on Thursday, March 18th, 2010 at 6:13 PM and is filed under Uncategorized. You can follow any responses to this entry through the RSS 2.0 feed. You can leave a response, or trackback from your own site.